2018 Yamaha Marine T50 High Thrust Conquer Water The T50, part of Yamaha's specially-designed High Thrust series, gives you added torque for pushing heavier boats. 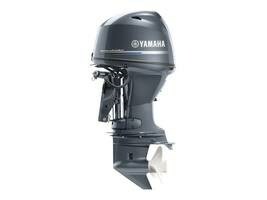 Because it's a 4-stroke, you get all that extra power in a super-efficient motor. Responsive Power The overhead camshaft design efficiently exchanges intake and exhaust gases for responsive power and fuel efficiency. Features may include: More Reverse Thrust Our unique dual-thrust propellers are designed to redirect the exhaust flow away, thereby reducing cavitation. This feature provides up to 60% more thrust in reverse.